The 2018 Clarity Plug-In Hybrid PHEV, Honda’S PLUG-IN HYBRID VEHICLE, COMES EQUIPED WITH A 1.5L 212HP 4 CYLINDER ENGINE WITH A ELECTRIC MOTOR, 17kWh LITHIUM- ION BATTERY, HILL START ASSIST, 18” AERODYNAMIC ALLOY WHEELS, MULTI-ANGLE REARVIEW CAMERA WITH DYNAMIC GUIDELINES, LED DAYTIME RUNNING LIGHTS, COLLISION MITIGATION BRAKING SYSTEM (CMBS), ROAD DEPARTURE MITIGATION SYSTEM (RDM), FORWARD COLLISION WARNING (FCW), LANE DEPARTURE WARNING (LDW), DUAL-ZONE CLIMATE CONTROL, HEATED FRONT SEATS, LANE KEEP ASSIST SYSTEM (LKAS), ADAPTIVE CRUISE CONTROL (ACC) WITH LOW SPEED FOLLOW, Honda LANE WATCH, BLUETOOTH, AUTO UP/DOWN WINDOWS, 8” DISPLAY AUDIO, APPLE CARPLAY AND ANDROID AUDIO, 180 WATT 8 SPEAKER AUDIO SYSTEM, AUTOMATIC DIMMING REARVIEW MIRROR, LED HEADLIGHTS WITH AUTO ON/OFF (LOW AND HIGH BEAM), LED TAIL LIGHTS, SMART WIPER SYSTEM, BODY COLORED DECKLID SPOILER, SMART ENTRY, PUSH BUTTON START, AND MUCH, MUCH, MORE. ***Are you looking for an all-around, reliable, sporty car? 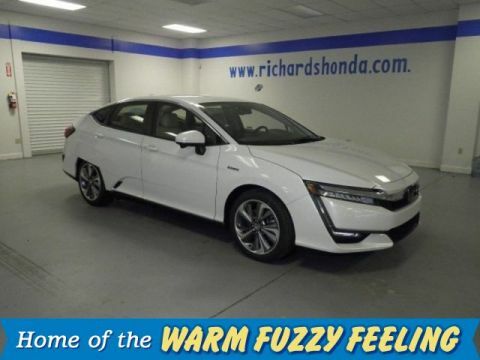 Then look no further than to this 2018 Honda Accord PHEV! It's loaded with standard features and among the industry's top safety technology! 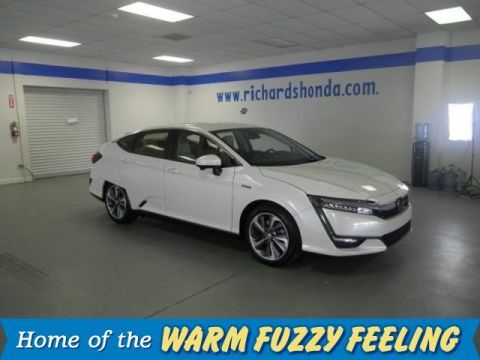 Why should you buy at Richards Honda? We have over 500 New Honda's available to choose from, we make the buying process quick and easy, and every new and pre-owned vehicle purchased from our dealership comes with a COMPLIMENTARY 1 YEAR/12,000 MILE MAINTENANCE PACKAGE! (See store for details) This luxurious, Platinum White Pearl 2018 Honda Accord PHEV could be yours today! Test drive today at Richards Honda, 7791 Florida Blvd. in Baton Rouge, LA or call us to schedule a VIP appointment! The 2018 Clarity Plug-In Hybrid Touring, Honda’S PLUG-IN HYBRID VEHICLE, COMES EQUIPPED WITH A 1.5L 212HP 4 CYLINDER ENGINE WITH A ELECTRIC MOTOR, 17kWh LITHIUM- ION BATTERY, HILL START ASSIST, 18” AERODYNAMIC ALLOY WHEELS, MULTI-ANGLE REARVIEW CAMERA WITH DYNAMIC GUIDELINES, LED DAYTIME RUNNING LIGHTS, COLLISION MITIGATION BRAKING SYSTEM (CMBS), ROAD DEPARTURE MITIGATION SYSTEM (RDM), FORWARD COLLISION WARNING (FCW), LANE DEPARTURE WARNING (LDW), DUAL-ZONE CLIMATE CONTROL, PERFORATED LEATHER TRIMMED SEATS, HEATED FRONT SEATS, 8 WAY DRIVER SEAT ADJUSTMENT, 4 WAY PASSENGER SEAT ADJUSTMENT, LEATHER WRAPPED STEERING WHEEL, Honda LINKED SATELLITE NAVIGATION WITH Honda HD TRAFFIC, LANE KEEP ASSIST SYSTEM (LKAS), ADAPTIVE CRUISE CONTROL (ACC) WITH LOW SPEED FOLLOW, Honda LANE WATCH, BLUETOOTH, AUTO UP/DOWN WINDOWS, 8” DISPLAY AUDIO, APPLE CARPLAY AND ANDROID AUDIO, 180 WATT 8 SPEAKER AUDIO SYSTEM, AUTOMATIC DIMMING REARVIEW MIRROR, LED HEADLIGHTS WITH AUTO ON/OFF (LOW AND HIGH BEAM), LED TAIL LIGHTS, SMART WIPER SYSTEM, BODY COLORED DECKLID SPOILER, SMART ENTRY, PUSH BUTTON START, AND MUCH, MUCH, MORE. ***Are you looking for an all-around, reliable, sporty car? Then look no further than to this 2018 Honda Accord Touring! It's loaded with standard features and among the industry's top safety technology! Why should you buy at Richards Honda? We have over 500 New Honda's available to choose from, we make the buying process quick and easy, and every new and pre-owned vehicle purchased from our dealership comes with a COMPLIMENTARY 1 YEAR/12,000 MILE MAINTENANCE PACKAGE! (See store for details) This luxurious, Platinum White Pearl 2018 Honda Accord Touring could be yours today! Test drive today at Richards Honda, 7791 Florida Blvd. in Baton Rouge, LA or call us to schedule a VIP appointment!